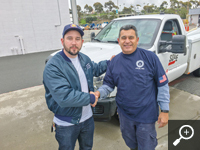 Bringing his utility truck to a stop at a traffic light south of San Diego one morning in January, Martin Barraza was shocked to see an overturned sedan, its crushed hood and front roof pressing against the pavement. The second jolt for the veteran San Diego Gas & Electric meter service technician was that no one in a long line of cars at the wide three-way intersection was headed to help. It may have been a case of a shell shock for motorists who'd just seen one vehicle strike another violently enough to send it flying. While some undoubtedly called 911, the clock was ticking for two senior citizens pinned upside down inside a car that was starting to smoke. Barraza, a 36-year member of San Diego Local 465, wasted no time. Flipping on his truck's hazard lights, he jumped out and raced toward the car, hollering for others to lend a hand. The driver and his wife, who appeared to be in their 80s, were conscious but clearly traumatized. "They were in shock," Barraza said. "They didn't talk — that's how I knew that they weren't doing well. The man was bleeding." Two men answered his shouts, rushing to help pry open the damaged doors. As thick smoke filled the car's interior, the trio's teamwork made it possible to pull the couple to safety. Barraza ran to get his truck's fire extinguisher and was dousing the sedan as paramedics and firefighters arrived. The husband was taken to the hospital; the wife was OK, as was the second driver involved in the accident. The police didn't interview Barraza, but a freelance reporter who happened to be nearby did. The local Fox affiliate ran it on the evening news, making his IBEW and SDG&E brothers and sisters proud, and spurring an invitation from the couple's son. "Mr. Barraza, come have dinner with me," he said on air, noting that his father was expected to fully recover. "I really appreciate it. I want to thank you again. Good people like you make this world." Calling his union brother's actions "phenomenal," Local 465 Business Manager Nate Fairman wrote to Ninth District Vice President John O'Rourke the next day to nominate Barraza for an IBEW Lifesaving Award. "It is without a doubt that Mr. Barraza's immediate use of his emergency first aid training, his situational awareness he displayed at the hectic crash site and his heroic actions extinguishing the burning car and pulling the family from the wreckage saved the lives of two complete strangers," Fairman said in the letter. International President Lonnie R. Stephenson approved the award in February. Fairman has invited Barraza's family to see him receive the award at a spring membership meeting. For Barraza, a single dad whose son and daughter are now young adults, responding to the Jan. 30 accident was an extension of what he's done in his job for 3½ decades — taking care of people through service calls. "I like what I do, I like being with the public and meeting new people every day," he said. SDG&E likes him, too. In an article on the company website, field operations manager Russ White said Barraza is a conscientious worker who always goes above and beyond. "He's been a terrific employee all of these years," White said. "I am not surprised he would go the extra mile for anybody who needs help." 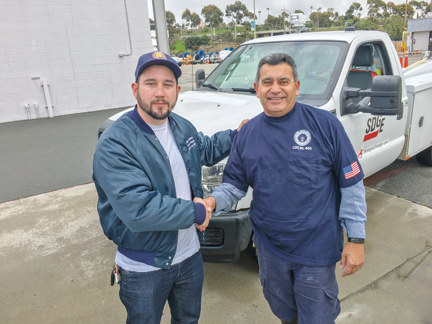 San Diego Local 465 Business Manager Nate Fairman, left, commends longtime member Martin Barraza, who was between SDG&E service calls Jan. 30 when he rescued two senior citizens trapped in an overturned car.